Adding products to your Woocommerce store can take time, especially if you have complex products with many sizes, widths and colors, such as shoes and apparel. By using xocbox systems with Woocommerce, you can speed up or even eliminate some of the time-consuming data entry that is needed to get your products online. 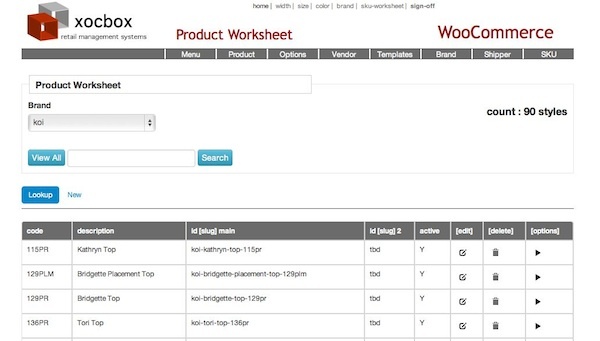 xocbox integrates directly with Woocommerce’s interface, enabling you to list multiple products quickly and easily using templates and worksheets through its cloud-based management system. 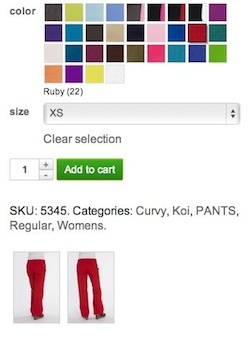 Help your customers make better purchasing decisions by showing them products with multiple views, colors, and swatches. Let xocbox help you by making image editing and swatch creation easier than you thought possible. Images can be added using xocbox, and you can edit, crop, and make swatches right from the xocbox screen. No need to use Photoshop, so you can eliminate purchasing multiple licenses for your editing team. Your Woocommerce store works seamlessly with WordPress and, of course, so does xocbox. Add shortcodes to your WordPress pages and create a specific category page for your Woo store by toggling categories on and off in xocbox. Are you being asked to place orders via EDI? Would you like to automate purchase orders with your suppliers, manage drop ship and inventory? Let xocbox help integrate your operations with our EDI products and services. Contact xocbox to learn how we can help you streamline your Woocommerce store business processes. xocbox offers a fully integrated pre-order module for your Woocommerce store. This allows you to sell products before they are available for sale, and works well for books, electronics and apparel. No need to remove products from the shopping cart that are not pre-order items. Works for all types of products and ebooks, and works with coupons too.